Today I have two cards to share, both made using Hero Arts new Frosty Borders Digikit. 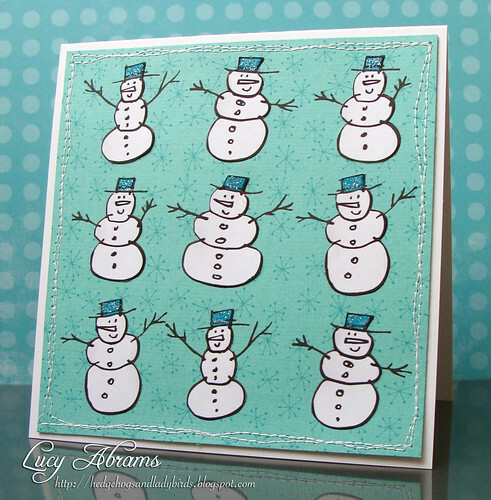 First up, this simple snowman card. I used the snowman border from the kit, but cut it up and rearranged them into a grid pattern. The snowflake background is also a border from the kit. I love the modern look to this stamp. Here I have used the Dot Snowflake border stamp from the kit to create the lovely swirly background to this card. 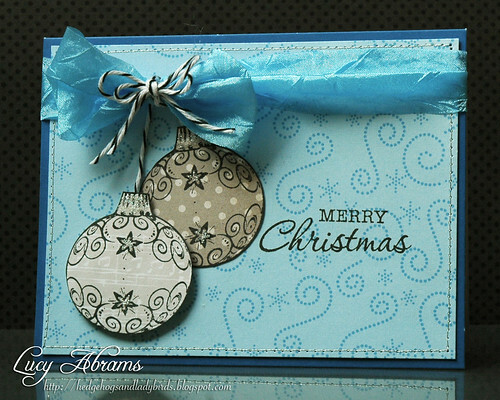 I also used Hero Arts Flourish Ornament, Very Merry Christmas and Merriest Christmas Wishes stamps. And the lovely silky crush ribbon and twine is from The Ribbon Girl. Isn't pool just one of the nicest and freshest colours in the world??? Beautiful cards Lucy, I love the snowmen! Both are just beautiful Lucy. Love the second one. That is just an awesome background. Love both of your designs! I like the variation of shapes on the snowman images! Looks natural like a real hand made snowman, too cute! These are gorgeous Lucy!! I agree with you about the Pool color, I can't wait to get some of those shades of cards and soft chalk inks for Christmas! !